I know I shared these last year but it hasn't stopped me picking up more to add to my collection - you know...for guests. It seems that the trend has very much caught on this year as I've seen these little jars pretty much everywhere in various forms and at various prices. Since some places have been charging as much as £5 for these, I would recommend picking one up in ASDA and the Pound Store for just £1. Whilst I love all things Halloween, I also love my decorations to be quite minimalist and simple. This year, my first and only port of call this year was Wilkos and they did not disappoint. 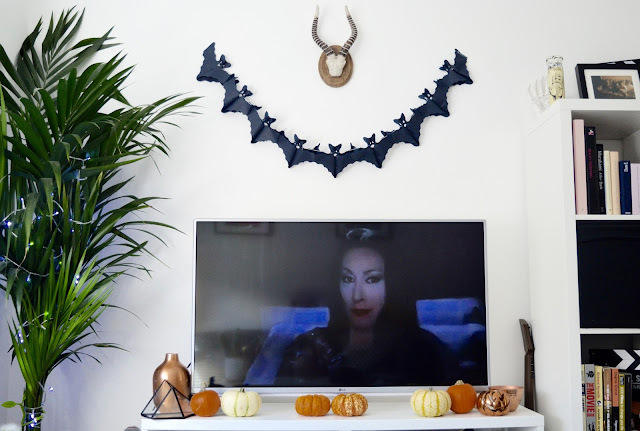 I picked up this amazing Bat Garland (also available in ghost and pumpkin designs) for just £1! Naturally, I got a few packs to keep me going but every time I look at it, I'm just in love. I also purchased some of these adorable copper coloured pumpkin tea-light holders. 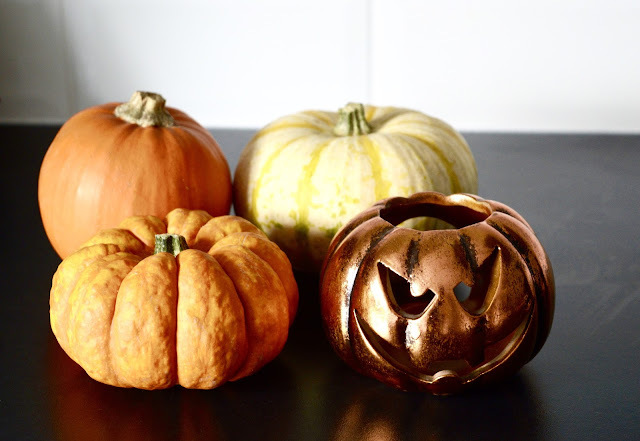 I love these as whilst they are clearly pumpkins, they really blend in well with my current home decor and double up nicely as a cool, everyday ornament. OK so these may not strictly be 'Halloween' but they do tick the glitter and pumpkins box. You may have seen these featured in my post from the SkinnyDip London #PSLSeason Launch Party and I just can't get enough of them; I think I may well use them all year round. Inspired by the Starbucks Pumpkin Spice Latte, these pieces were created by SkinnyDip London to encapsulate all things Autumn. 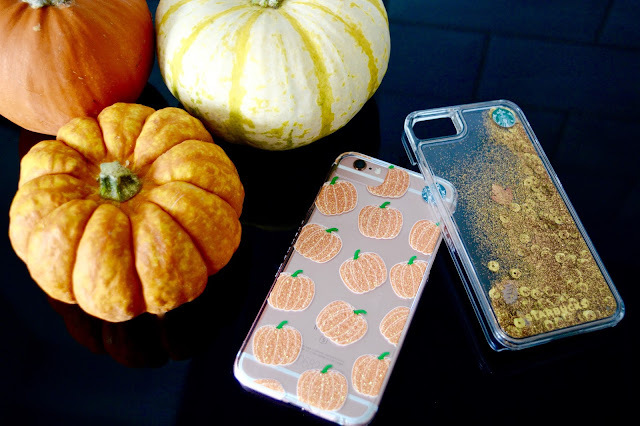 I'll be honest, I'm not over the moon with the Starbucks logo in the top right corner of the cases but I actually don't notice it as much as I thought I would and I adore my sparkly pumpkin case. You can check out the full range here. 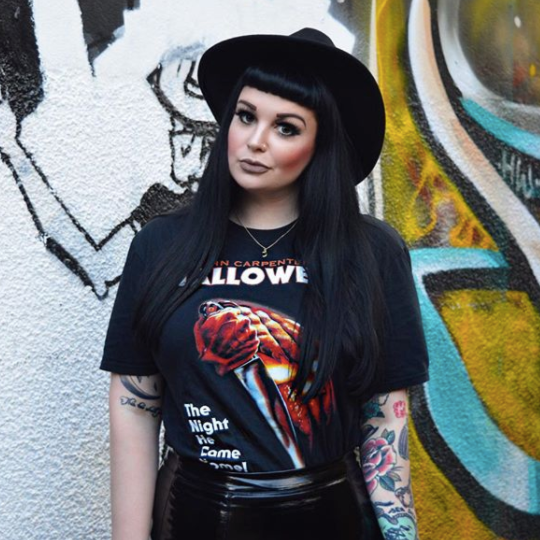 One of the best things about Halloween, besides all the amazing homeware, is the scary movie marathons. 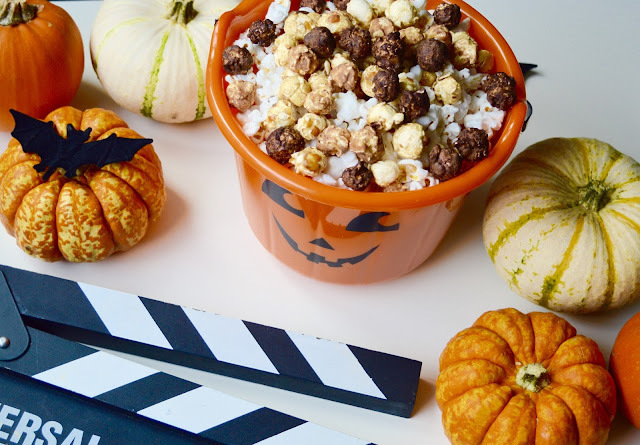 Of course, you can do this all year round but there's something extra exciting about stocking up on a ton of snacks, turning the lights off and watching horror film on All Hallows Eve night. For me, my go-to cinema snack has always been popcorn (and occasionally some super sour sweets). Thankfully, the lovely people at Popcorn Shed* very kindly sent me a whole load of their gourmet popcorn to make my movie nights just that little bit sweeter (...get it?). All of their products are made using all natural ingredients and are both vegetarian and gluten-free. So far I've tried out their Rich Chocolate, Pecan Pie (my favourite one) and Salted Caramel (delicious). So if you fancy splashing out on some gourmet Halloween snacks, they've got you covered. Check out their website here. My collection of Halloween socks knows no bounds and probably one of my most favourite buys so far were these amazing socks from New Look (3 for £5). 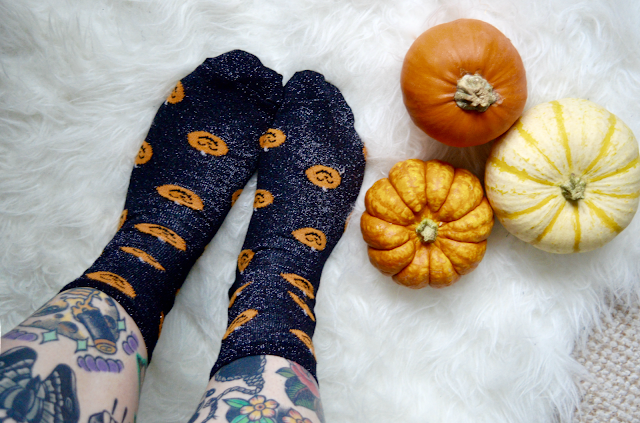 I absolutely love anything that sparkles and has pumpkins on it so you can imagine And let's face it - I'm going to wear these all year round anyway so money well spent. Well, that's it for my Halloween favourites. I'm sure they'll be even more treats to come. 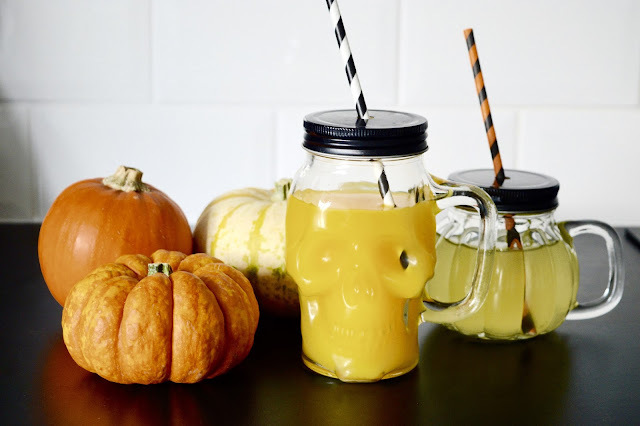 What are your Halloween favourites? How are you getting ready for October 31st? As always, I love reading your comments so please do leave me lots of lovely ones below. *Disclaimer: This post contains items which were gifted to me for the purposes of review. As always, all opinions are my own and do not reflect that of the brand. The garland and the pumpkin are super cute! I got a skull drinking jar this year, plus a skull tall bottle from tiger that is actually pretty cool. And the obligatory skull candles. I keep them as decorations all year though! 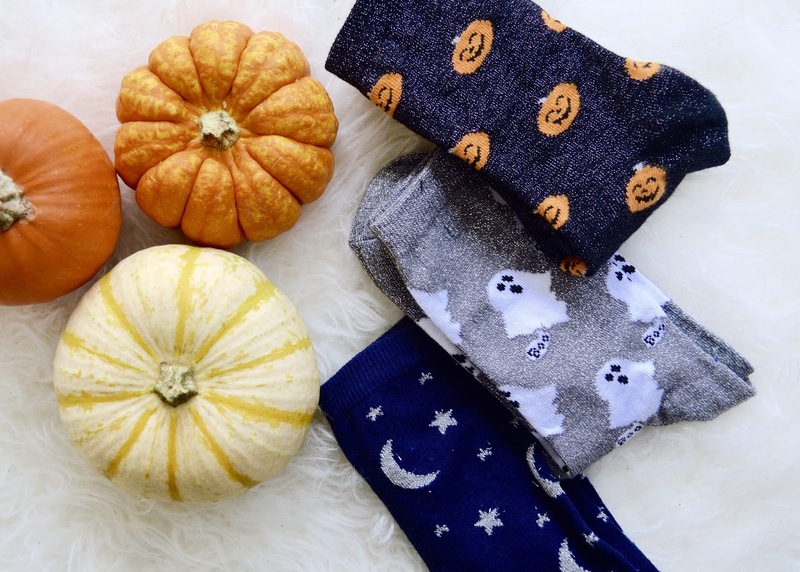 Your socks are ever so cute especially the Pumpkin ones! They're ever so cute. What absolutely great favourites! I especially love the socks! I’m not much into Halloween but these things are too cute!